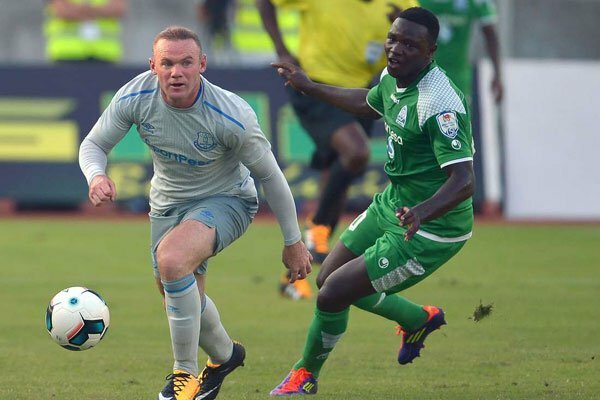 Gor Mahia put on a brave fight against an English Premier League side Everton. And it was an Everton side that deployed 8 full internationals including England Captain Wayne Rooney. A side that is coached by Dutch legend Ronald Koeman and his twin brother Erwin. Gor Mahia were certainly not overawed and knocked the ball around confidently even in their own 18 yard box and under pressure. Kogalo’s fitness was also showing as they pressed the Toffee players given them little space. 28 minutes into the game, Kogalo almost scored when Kagere met a Walusimbi cross which had been deflected into his path. He turned quickly but his goal-bound shot was blocked by a defender. Wayne Rooney gave Everton a lead with a scorcher in the 35th minute after being given acres of space to shoot. It was a similar goal to the one that launched Rooney into fame as a 17 year old many years ago. Soon after the goal, Gor Mahia earned a corner kick when Nizigiyimana made a darting run on the right flank, forcing an Everton player to concede a corner. Jacque Tuyisenge scored the equalizer soon thereafter when he powerfully headed in a corner kick at the near post and from an acute angle. The header was similar to the one Peter Dawo scored against Esperance in 1987. Gor Mahia had only two players in the box. Tuyisenge ran towards the near post. The corner kick was placed right in his path by Muguna. He rose and headed it skilfully from a difficult angle. It appeared well rehearsed as was the case in 1987. Gor Mahia gained confidence after that goal and made numerous forays particularly down the right flank. In the 41st minute, Muguna put Tuyisenge through. The latter deftly lost his marker and unleashed a grass-cutter which was saved by the Everton goalkeeper. Gor Mahia gave a very good account of themselves in the each half. The defensive line was composed and organized as their offside traps worked to perfection. Boniface Oluoch showed a lot of confidence in handling back passes under pressure. As the second half started, Tom Davies intercepted a pass intended for Nizigiyimana and raced towards the goal. But a timely tackle from Nizigiyimana cleared the ball for a corner. . A minute later, the lively Tuyisenge hussled to contest a backpass to the goalkeeper. He blocked the keeper’s clearance but the keeper was able to collect the resulting high ball. Philemon Otieno had the next scoring chance when he picked up a cleared corner kick on the edge of the box. But his shot was easily handled by the goalkeeper. In the 55th minute Gor Mahia worked their way down the right flank. Muguna’s cross was met by Tuyisenge. But under pressure from two defenders, he blasted wide. Everton had the ball in the net in the 64th minute but at least two of their players were in an offside position. A minute later, Everton were charging forward again and Dominic intercepted yet another pass and charged towards goal. But his shot was well saved by substitute goalkeeper Odhiambo. Odhiambo was forced into yet another save this time an effort by Idrissa Gueye following another interception. In the 79th minute, Mugiraneza conceded an indirect freekick. The ball was played to Kieran Dowell who smashed his shot against the cross bar. Everton were finally rewarded for their effort in the 81st minute. They scored the second goal in the 85th minute via Kieran Dowell who unleashed a long range shot. In injury time, late substitute Oliver Maloba danced his way into the Everton danger area but ran out of options as there was no one to cross to. Seconds later, Mbugua was gifted with a good shooting opportunity but his effort went directly to goalkeeper Stekelenburg. All things considered, Gor Mahia gave a good account of themselves especially in the first 60 minutes. The multiple substitutions took them off their rhythm. Starting XI: Maarten Stekelenburg, Ashley Williams, Phil Jagielka, Callum Conolly, Jonoe Kenny, while Morgan Schneiderlin, James McCarthy, Aaron Lennon, Ademola Lookman, Davy Klassen, Wayne Rooney. Though it would have been good to send our youth team , that’s the game I want to see, no tiki taka , no complications , just direct football delivering results. Congrats , that was a good account, we actually won big. That is the spirit of Kogallo. This coach looks promising. It seem I may be back to Stadium sooner than I expected. Some technical football seem to be re-emerging.cearly deviating from direct football(jodala type) let me see next few matches in sofa branch. we have no time to experiment, Gor has to win the league. GOTV is gone, we have no options and the coach has to learn this the hard way. The boys can play in EPL or Laliga…. As someone had said , let’s now focus on the league. …. Otherwise the match was balanced and I cannot fault any player. Karim , Musa, Shakava and the rest did not give Rooney time…. Good game from both sides..at the end of the day its the English premier league football experience that carried the day.All the players gave a good account of themselves. They will come back home with their heads help high and they will bring back vital lessons,a once in a lifetime experience,memories,..name it.Focus now shifts towards lifting the SPL..all the best to the boys and congratulations for the job well done against akina Rooney,Lennon,Barry,Baines etc..the stuff we only see on Tv!! Jasego you have spoken for a million of us. Technical football. That was a glimpse of the Lens Julians era. And that is what i say all long, we want some Technical football and i hope the right person is here. Excellent performance. I was prepared to see our boys conceeding 10 goals. Congrats to Kogallo legend Zico. Some people are trying to associate Kerr with the steler performance! Give me a break. Hiyo yote Ni Zico. Congrats my Legend. Kerr bado hajajua hata players. Zico na Everton coach wako tu sawa. Kerr pod one gik mongeyo omiyo wekuru thingo’ ji Ni Kerr Kerr. Miriambo mingi sipendangi. Get lost with your nonsense. Are you thinking with your brain or jodala mentality? Excuse us with your nonsensical statement. I am here to stay. Go and order your wife not me. Am entitled to opinionda. The problem with you is that you hate the truth. I repeat that Kerr bado hajajua hata making ya players. Jodala mentality makachietha. Zico is my Legend. Jadala for life na si tafadhali. We have to respect the Brazilian, zemaria,. Let’s swallow our pride and accept that neat football in gor was his invention. What you saw in tz was zemaria’s football. Congrats kogallo!!! Not bad, especially in first half when the big boys were in. 1st. half was good to see the team go forward. I really liked the confidence. Second half was all Everton, and the subs were shaky trying to build from the back. They were pegged in. Still, I am happy. Am very satisfied with the performance and for once i do accept that yesterdays performance can be attributed to Frank Nuttal, Zemaria, Zico and of cause Ker presence. We are still one team whether its jodala or jomoko nono. Kudos to the team,by cannot somebody tell me are GM defenders programmed to backpass even when a player is all alone,he choses to give bony who kicks it 4ward to 50/50 ball then all of sudden mbio kwetu(especially musa),brave for the coach to pull him out.Kudos to Wellington in similar position that musa would have played back pass he played forward. The substitute goal keeper really made some serious saves. I think he should be given more play time. Otherwise some back passes almost led to free goals for Everton. Otherwise labda they got intimidated a bit by the mere thought of playing against an Epl team. Very positive observation bwana, he is filling the void that Boni is leaving. We played quite well in the first half. However, we lost the mid-field to Everton in the second half. This contributed greatly to Everton camping in our half after the break. It was evident that Everton changed tact by playing three touches football or holding the ball longer: something our second half substitutes could not cope with easily. Comparatively. our second half substitutes were a little bit slow at decision-making. All it was a great performance by Gor Mahia. Question: where is Maqbul? , our movement off the ball and running into space greatly improved under Ze Maria and we can use this to build on all those other aspects of our game , Innocent Wafula should learn to run with the ball while facing up and decide in advance what the end game of his moves are , Nzigi ako juu and a combination of what he does with a replica of what a Marcelo like from the left wing can do , place a Striker who can recieve from the wings and finish or who can receive from the mid and hold while drawing other players into attack options , then with our new coach we are good to go , ofcourse stability off the pitch , from the boardroom to the bench n terraces would be of great help. Finally for the whole week , I have been doing a bit of media monitoring in the BBC , Daily Mail , Mirror Uk , Liverpool echo , Kenyan , Ugandan and Tanzanian dailies n the buzz this Everton game has created , a Marketing Guru would have killed it , The exposure n publicity this game has given as is the kind any marketer would give an arm n limb for n I hope n pray that our Ec were not just going thru the motions n that his game has given them some benchmark n best practices to work with. I think we’ve shown the world that K’Ogalo is not a small team by the goings on the field. Even though our players were up against the millionaire’s in the world of football, they showed some quality & proved that what Rooney can,we,can also do. The fact that we scored against them speaks volume. Everton was established in 1878 while Gor was established in 1964 so the gap is too wide btwn these two teams. Can body confirm to me that last offside call on Gor mahia was a correct call, bcoz according to me there was no off side but the lines man was confused to think that Everton shud not,concede another goal. Gor Mahia was formed in February 1968. 1964 ni ile paka mwitu ya ingo. Everton’s preason season friendly is now behind us. Like someone has said a great marketing opportunity that EC can use to attract resources, to the club not their stomaches. Interestingly, on the field, twas an all too familiar story of wasted chances and Boni’s “weakness” with long shots (remember CECAFA/Azam free kick). Hard decisions need to be taken as regards our striking and goal keeping something which we’ve known for sometime but maybe TB doesn’t want to “ruffle feathers”. We must focuss now on the league and CAF. On reflection i wonder “how” we are year in year out eliminated from CAF early rounds by teams like CNaps. EC MUST NOW TAKE GMFC TO THE NEXT LEVEL.10 UNINTERRUPTED YEARS EXPERIENCE AT THE HELM MUST START TO SHOW BY WINNING TITLES AND AT THE VERY LEAST MAKING IT TO THE GROUP STAGES OF CAF. I notice that Kagere is a good poacher but cannot be left to be an out and out striker since he cannot keep up.But what of Jean Baptists Mugiraneza;how does he play;is that his best? On a light note , its a ” Great Honour” for Bony to have conceded from Wayne Rooney , He now joins the ilk of Peter Cech , Coutaour ,Mignolet , Ospina and Carlos Bravo. @teddy, no need to display inferiority complex,it was also an honour for wayne rooney and everton fc in general to play with the likes of bonny, meddie , wendo , walusimbi and the likes. Jodala deserve respect yajowa ! The outcome of this match could have been different if Gor Mahia’s forwards were on song. This underscores our striking woes. The other worrying matter is our leaking defence which has conceded at least one goal our last four matches. Kwani, Why did he start off by “on a light note”? Why are some so trigger happy of late?? Anyway everyone is free to air their opinions. @BB I concur, the scoring rate of all our strikers is woeful. Why should it continue to be so? Let’s scout widely to resolve this migraine. If the current lot don’t improve even with Ker then its more likely a player quality problem but is TB willing to bite the bullet and comprehensively address the problem. Jeconiah does what in GMFC’s senior squad? Finally I bluntly put it to bloated EC, there is no need for the fine performance against Everton only to be embrassingly be bundled out of CAF premlinary rounds or fail to win the league. Please put in adequate transparent structures in place. Is SportPesa willingly to improve our sponsorship package now? Once one believes in him/herself, then you do not see the giant but the opportunity for good. That is I think Gor had and it paid off This might just take the team higher in the league. Congratulations are in order. Thats a nice one gor.naona tukienda worldcup sasa.